On Friday, President Lukashenka announced that the promised Chinese loan of $7billion would help Belarus cope with the current crisis. 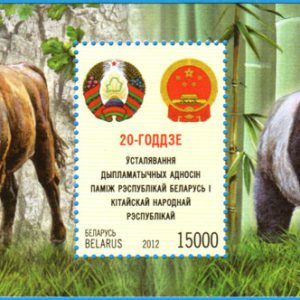 Belarusian Stamp Dedicated to 20th Anniversary of Relations with China. A week before this announcement, he had gone to China for his eighth visit to Beijing. Is Belarus succeeding in befriending the rising Asian power? The devil that exists in Belarusian-Chinese cooperation hides in the details, and statistics on bilateral trade and its structure reveals a bleak picture. Belarus suffers from a huge trade deficit and its exports to China are mostly potash. This is the only thing which Beijing eagerly buys from Minsk in large quantities. Chinese and Belarusian officials swore to improve the trade balance between both states, but the promised loans have gone to increasing the production of potash, which China needs. Minsk since the middle of the 1990s aspires to closer relations with Beijing. Belarusian officials talking of relations with Beijing frequently use the expression “the great China.” They only call Russia and China "great". Minsk publicly welcomes Chinese policies even on intra-Chinese affairs. Thus, on 2 July Minsk promptly welcomed the new Chinese Law on National Security, which had been adopted by Beijing the day before. On meeting Chinese Vice Premier Zhang Gaoli on 2 September, Lukashenka said, “The entire modern history of Belarus is linked with the People's Republic of China.” Lukashenka visited China in 1995 for the first time as president, and recently he went to Beijing on his eighth visit. Chinese leaders have come to Minsk twice, in 2001 and May 2015. The visits of various relatively high-level officials occurs regularly, often it occurs every couple of months. Minsk hopes that the political support it demonstrates to China will pay off in the future because China's rise will unavoidably result in Beijing becoming a global centre of power. So far, however, it is difficult to find tangible Belarusian gains from cooperation with China. Nothing illustrates it better than the basic data on volume and structure of bilateral trade. Success or Failure in Trade with China? The Belarusian state news agency BelTA boasted of the governments successes in developing trade with China from $792.9 million in 2005 to $3,207.3 million in 2014. It omitted to mention that this trade over in the past ten years constantly ended in a huge, multi-million dollar deficit for Belarus. The last time Belarus had positive a trade balance with China was in 2005. Even after Belarus in 2014 increased its exports to China (by 39% to $640 million) and cut its imports from China (by 16% to $2,373 million), the deficit still made up a colossal figure for Minsk. It was considered to be more than $1.7 billion. On 31 August, the Belarusian president signed a Directive on the development of bilateral relations with China. This directive stated that it would try to more than double the volume of Belarusian exports to China (to reach by 2020 at least $1.5 billion) by improving conditions for bilateral trade. The proposed measures included introduction of electronic quality certificates and assigning more personnel to develop relations with Beijing. As the following table shows, the structure of Belarusian exports to China looks gloomy. The absolute majority consists of potash fertilisers, with chemical products lagging far behind. In addition, some commodities are exported unprocessed or minimally processed. Exports to China have so far not helped to resolve a strategic task of the Belarusian government, which is to find a market for a machine-building industry. This will save a major branch of the Belarusian economy. Chinese exports include more advanced products, like computers, communication equipment, spares of cars and tractors, engines, and TV sets. Sure, many of the troubles encountered by the Belarusian government are not unique. They follow the same pattern found in other states that trade with China, as China becomes a global economic power. But compared to others two aspects of this situation stand out. First, it is China which sells Belarus more value-added products, for example, products which are more technologically advanced and better processed . Belarusian exports to China include very few sophisticated commodities. Even Belarus' national symbol, the flax, arrives in China largely unprocessed. Second, have all the efforts undertaken in the last two decades to develop relations with China achieved better results for Belarus? In other words, would trade with China look more profitable for Belarus in terms of a trade deficit and export structure, had the Belarusian government since the mid-1990s not committed itself so unreservedly to a partnership with China? According to Belta news agency, this May the Chinese leader Xi Jinping Belarus promised in Belarus that “China is going to increase import of high-quality and competitive goods from Belarus.” Lower-rank Chinese officials explained what Beijing meant by that. Indeed, in May, the Belarus Potash Company and the Chinese Sinochem Group signed a memorandum of understanding about cooperation for the next five years. It envisaged sales in 2015-2019 of four million tones of Belarusian potash fertilisers to China. The deal would cost $1.3 billion. On 11 September, Belarusian media reported that $2 billion out of $7 billion of loans promised by Beijing had been allocated to fund the construction of Nezhyn Mining-and-Processing Integrated Works which should produce even more potash. If so, the promised Chinese loans will serve Chinese rather than Belarusian interests. Beijing wants little more than potash from Belarus. As Andrew Nathan and Andrew Scobell noticed in their book China's Search For Security, despite China's global significance, it remains a "local power." Outside Asia, Beijing looks only for raw materials (mostly hydrocarbons), technologies, investment opportunities, markets and diplomatic support. Out of this list, Minsk can offer only potash and its voice in international organisations. Both are of limited value to Beijing. Thanks to cooperating with Beijing Minsk for its part has managed to get some additional political leverage, in particular to resist Moscow's pressure. The excellent relations established with Pakistan are in part due to Chinese suport. Minsk also got strategic gains, for example, by diversifying its partners in the defence sphere. Yet the economic results, both in terms of trade and investments, look bleak. Currently Minsk is launching the Belarus-Chinese Industrial Park project in the vicinity of Minsk. There also remains talk of Belarus' participation in the Silk Road Economic Belt, however, it looks like a new desperate attempt to repair the relationship between Belarus and China. The Belarusian economy keeps on contracting: in January-July it decreased by 4 per cent. However, a number of positive trends have arisen: wages and employment are stabilising, along with improvements in current account balances. The latter might signal an imminent recovery, but that remains questionable. Increased sensitivity to global financial turbulence and the lack of policy capacities may cause a deeper and sustained recession. In January-July 2015, the economy performed rather poorly: GDP dropped by 4 per cent, and this was accompanied by shrinking employment and wages. This means that in 2015 GDP contraction will be more than 3.5 per cent as most analysts agree. A 4.0 – 4.5 per cent contraction in 2015 seems likely. Moreover, perspectives for 2016 are deteriorating: expectations of poor growth might be soon substituted for expectations of a continuation of recession. From the demand side, poor investment activity explains the deteriorating environment. The majority of firms have adjusted to a shock reduction in foreign demand by making fewer intermediary imports, which has a roughly neutral effect on GDP. However, this adjustment has not been sufficient and firms have had to reduce their investments as well. High interest rates and labour costs have strengthened this trend. Such adjustments by businesses mean that the social impact of the current economic downturn has been relatively soft. However, it implies more challenges for a rapid recovery and weakens the environment for long-term growth. At the beginning of the year, the labour market reacted sensitively to the economic slowdown: both employment and real wages contracted. However, in the last couple of months this relationship has dwindled. First, the rate of decrease in employment has slowed. Second, the quantity of ‘idle hours’ initiated by employers has begun to go down. Third, real wages have recovered from a huge drop at the beginning of the year, and have actually stabilised near the average level of 2014 (see Figure 1). A number of factors can explain the stabilisation of the labour market. First, the private sector (or part of it) might be satisfied with the current level of labour costs which resulted from substantial cuts at the beginning of the year because it it more competitive. Second, in May and June some positive signals in foreign demand may have pushed firms to stop making further adjustments to labour costs. Third, the government might have intensified its administrative tools ahead of the presidential election. From this perspective, Lukashenka’s statement that state-owned enterprises should do their best to save their labour force despite the recession might have had an impact. Contraction of demand abroad triggered the current recession in Belarus. Similar shocks in previous years led to a significant deterioration in the trade balance, as a reduction in exports was not compensated enough by a reduction in imports. However, this time the adjustment to foreign demand shocks has been different. Currently Belarus is demonstrating substantial improvements in its trade balance (see Figure 2). First, this is due to a shift to a floating exchange rate regime, which provides near stable price competitiveness for Belarusian producers. Second, the recession environment contributes to a better merchandise trade balance: less disposable income guarantees less demand for imports. Third, the government has tightened its administrative pressure on imports. Finally, during this year Belarus has displayed a persistent surplus in its trade of goods and services. Surplus in trade together with the inflow of oil duties which were previously ​re-channeled to the Russian budget will lead to significant improvements for Belarus. 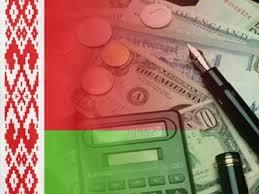 In fact, it means that Belarus in 2015 does not need foreign borrowing to finance its current needs. However new borrowing for repayment of old debts is still on the agenda. Overall, one may argue that the current recession and new policy mix is a painful but purifying treatment for the Belarusian economy. However, such a conclusion may be challenged because of the increased sensitivity of the national economy to external shocks. This sensitivity stems from structural weaknesses and distortions accumulated during the periods of voluntary policies. In the current policy mix, the nominal exchange rate should absorb a huge part of the external shocks. Given the relatively stable external environment, this mechanism works properly. That was the case, say, in the second quarter, when foreign financial markets, oil prices and exchange rates of major currencies for Belarus (USD, EUR, RUB) were relatively stable. However, in case of more severe shocks and correspondingly large exchange rate adjustments, the mechanism stalls. Belarusian households still perceive large exchange rate swings as a signal of further financial turbulence, rather than a shock absorber. This leads to deposit dollarization and demand for hard currency to increase, thus propagating the shock for domestic financial markets rather than dampening it. A similar story took place in July and, especially, in August. A new round of global financial market downturns led to cheaper oil and depreciation of the Russian ruble. The Belarusian ruble followed a similar path to the Russian one, which resulted in a roughly 15 per cent depreciation in July-August against the US dollar. Lowering demand for national currency accompanied depreciation. The worries of households also amplified it: Belarus had to redeem Eurobonds issue worth $1bn given a very low level of international reserves. However, a new loan from Russia (the equivalent of $760m) allowed passing the Eurobond redemption without reduction of reserves, which mitigated the pressure on the financial markets. Although depreciation has not triggered a new wave of panic on the domestic market, it exposed existing challenges. First, the current policy mix is still weak in the face of huge shocks. Second, the authorities cannot afford a rapid reduction in interest rates as it increases sensitivity to shocks. This means that getting out of recession will take a long time, especially against the backdrop of global financial instability. Hence, a deep and sustained recession seems the most likely scenario for Belarus.